The big story got even bigger after a cover was planned for Burnley’s first ever home match in the FA Premier League. When the fixture list was made public, their opposition was none other than the Premiership Champions, Manchester United! The date of the fixture being Tuesday 18th August 2009 – fantastic because that was also the date for Royal Mail to issue a set of attractive stamps featuring "Post Boxes". A disappointment followed when it was discovered that they would be issued in a miniature sheet format with all four values up to 90p being in the one sheet and no single 1st class stamps in their normal sheets were produced. However further research showed that by purchasing the more expensive "Generic Sheet" of stamps, a selection of various Post Boxes were shown on stamps attached to the first class Post Box stamps and very attractive too. As these were only available from a few selected post offices, it was decided to use these on the match day covers to make them rather special "First Day Covers" with these more unusual stamps. The result being that the total number of covers produced has been split with some having the date of the 18th August and others having the 19th August 2009. A small number were sold at the Burnley club shop with no match result on and these are scarce as remaining covers had the result added. 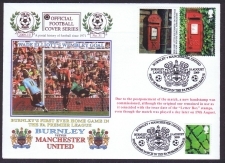 It also meant that for the first time ever, a football match has appeared in two Royal Mail handstamps - on different dates - this is a must for collectors of all types - it is UNIQUE! !